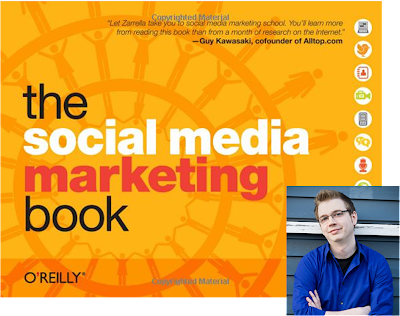 Book Review: The Social Media Marketing Book from O’Reily - Dan Zarrella - Blogging to Fame! Dan Zarrella with his book “The Social Media Marketing Book” introduces social media and guides on how best to use this media for the marketing of your business. Almost anyone can practice the workable solutions provided in the book, and make sense of the complicated social media environment. For anybody who is new to social media marketing Zarrella introduces each basic building blocks of social media, including blogs; multi-media; microblogging; social networking; social news and bookmarking, in different sections. Within each section, Zarrella introduces a tool, talks about its history, and describes the protocols, features and functionality with the help of screenshots, graphs, and visual explanations. The book is lean and with 224 pages of which half of them are screenshots and images, it is indeed a highly-tactical guide of significant value to any individual or organization looking to get into social media. The book also does a good job of showing the difference between different social media sites, such as pure networking (LinkedIn, Facebook), media sharing (YouTube, Flickr), blogs, microblogging, and bookmarking (Reddit, Delicious, Digg) and more. Throughout the book, there is good advice and it tells you what works and does not work. Zarrella makes an observation that is crucial to ones success for a business use of Facebook. He notes that for businesses, the best social media marketing is always going to be done by your fans, not by you. on the topic of forums, he reiterates the importance of fans, writing that a business should not underestimate the power of networks of niche forums to drive impressive numbers of visitors to your site. Once again, the best promotion comes not from the business, but from its fans. The chapters on strategy and measurement have some good piece of advice. He discusses of "call to action" (CTA) in which the marketer, tries to engage visitors on the website. He also stresses on the importance of goals and describes several tools you can use to measure return on investment and engagement as a result of your social media marketing efforts. The book does justice to social media tools but could have also emphasized more on the social graph (people, relationships and conversations) the focal point of social media. The human element of social media could have been better explained on the interaction with consumers, clients, and potential leads through social media tools. There are loads of interesting and useful tips in this book. Zarrella also provides anecdotes from various social media gurus and notables to share their wisdom along with classic examples of Comcast, Zappos and Dell. Dan Zarrella currently works as a marketing product owner at HubSpot. He has written extensively about the science of viral marketing, memetics and social media on his own blog (danzarrella.com) and for a variety of popular industry blogs. "There is a lack of practical, tactical advice on marketing bookshelves concerning social media," says Zarrella (@DanZarrella). Rather than talk about just 'engaging in the conversation' I wanted to give readers a hands-on introduction to the social web and what it can do to impact their business's bottom line." He continues: "Young people today are spending enormous amounts of time on social networks and in the changing world of marketing their status as digital natives can make them valuable assets to businesses. This book can be the first step for turning social networking addiction into a marketable skill." Guy Kawasaki, co-founder of Alltop.com truly says "Let Zarrella take you to social-media marketing school. You'll learn more from reading this book than a month of research on the Internet." This is from my post in 2020Social Blog. Very nice review , very well written. it is a book I will check out. You explained it's contents very well. I also put a link to this article on my blog.